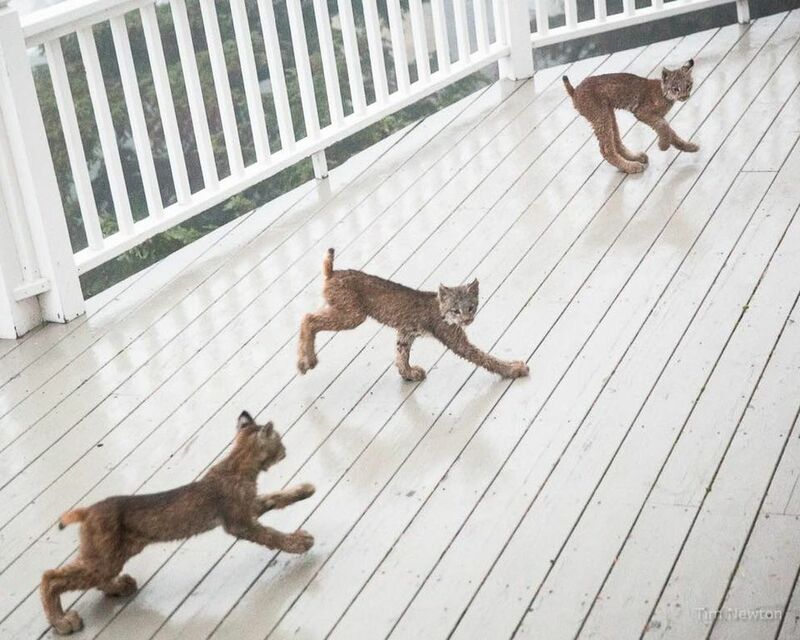 An Alaska photographer's images of a lynx and seven kittens scampering outside his house on the Anchorage Hillside have gone viral, generating worldwide headlines and millions of views on a brand-new Facebook page. 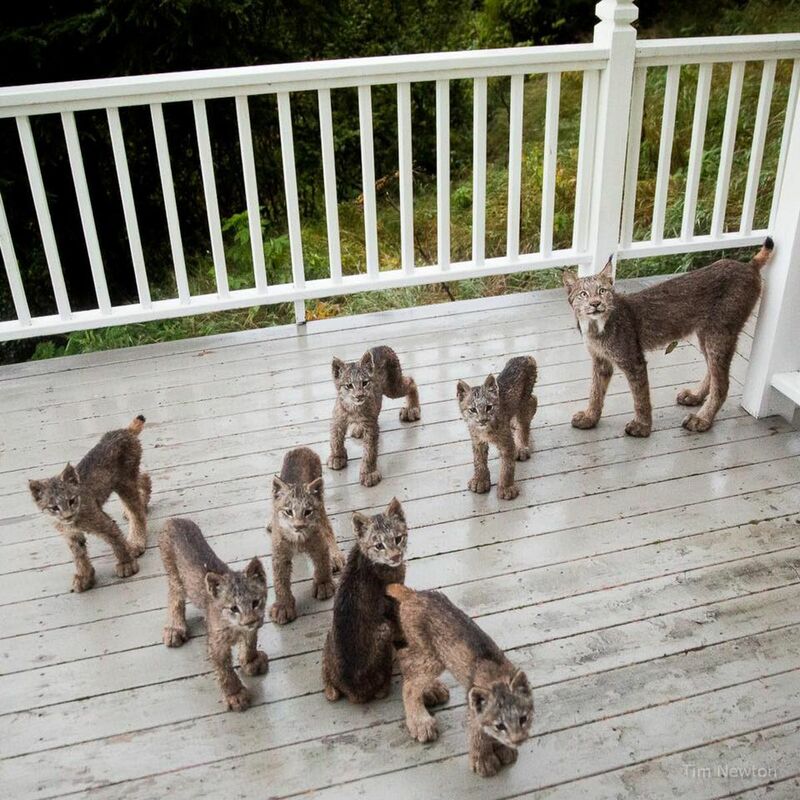 The 40-minute impromptu photo shoot in mid-September, when the lynx family had turned Tim Newton's deck into a feline "romper room," was rare because the animals are so elusive, said Newton, a lifetime Alaskan and engineer by profession. Calling himself "old enough to play Santa Claus without a fake beard," Newton said he's had six sightings of lynx in his lifetime. All were fleeting until now. Newton figures the lynx may have been hunting hares in the land surrounding his house, leading to the visit on his deck that morning as the kittens enjoyed time away from the tall, wet brush. He'd found a couple of hare carcasses near his house around the time the lynx showed up. 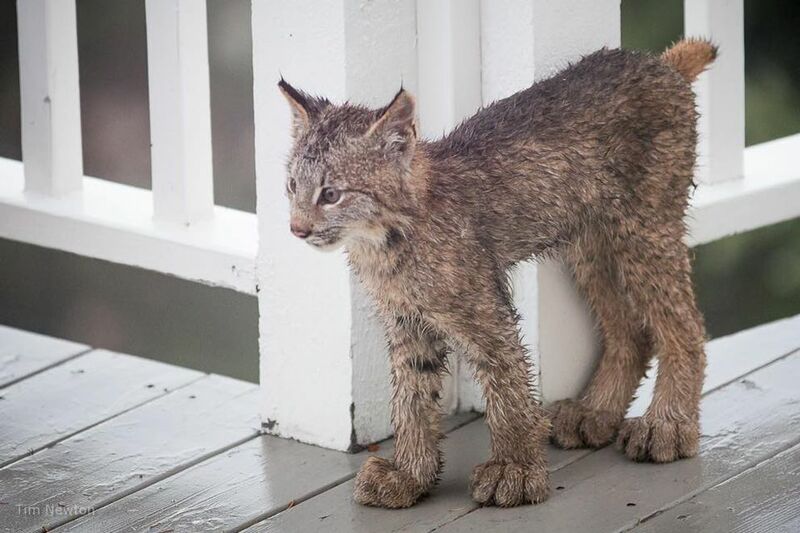 After the surprise sighting of the big-pawed, short-tailed family, Newton's wife, Cathy, created a Facebook page for the pictures. She'd long urged Newton to make such a page, to showcase his outdoor photography. Within days the site generated some 15 million views of septet and mother, not to mention thousands of comments and followers, he said. "My wife said there are 100 news organizations that are carrying the story," Newton said Monday, while awaiting an interview with the New York Post. News inquiries have come in from Brazil, Italy, even Israel. "It's been great fun," Newton said. Ken Marsh, spokesman for the Alaska Department of Fish and Game, said some snowshoe hare populations appear to be growing in portions of Southcentral Alaska. Hares are a primary food for lynx, he said. Lynx numbers rise and fall in response to changes in the hare population. 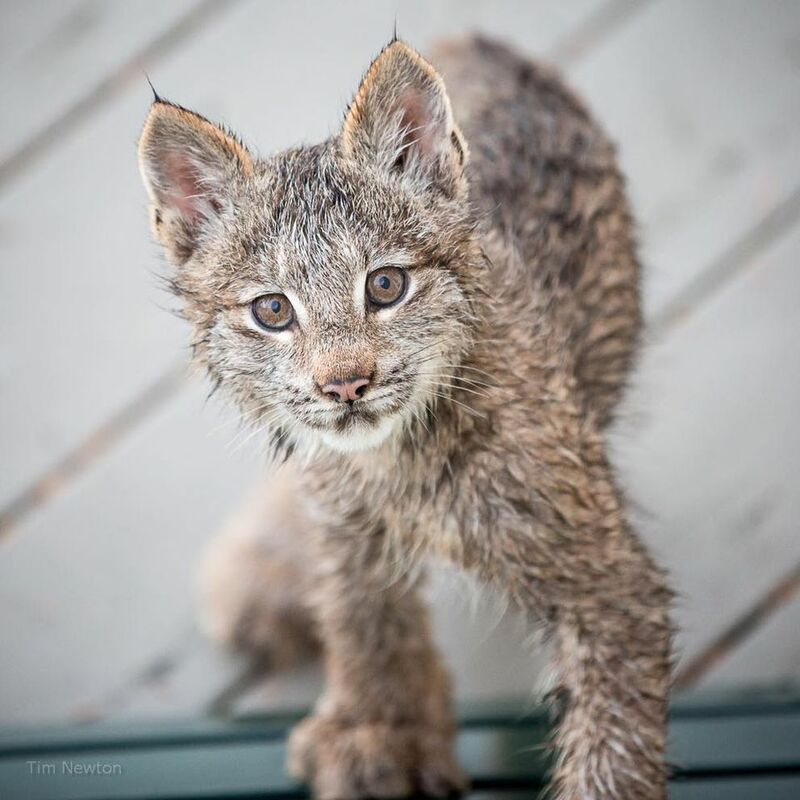 It's more common to see litters of lynx with three to four kittens, Marsh said. The large size of this litter could signal the mother has had a good season hunting hares. Based on the size of the kittens in the photos, they were born this spring and are learning to hunt, he said. "I'd say food is available and the mother is doing a pretty good job providing," Marsh said. Newton said he feels "unbelievably privileged" to have witnessed the lynx up close. That morning, after capturing more than 150 images from virtually every window in his house, Newton eventually crept outside, hoping not to be noticed for fear of startling the family. As he clicked away, initially unnoticed, it turns out one kitten was more intrigued than afraid as mother watched from nearby. The kit came within feet of Newton's lens, allowing him to get close-ups until he "made the mistake" of revealing his face. The sight of Newton's eyes sent the animal skittering away, he said. Soon after the mother, with litter in tow, "melted" into the wilderness. Newton said he'll be adding more of his work to the new Facebook page, as well as a second site. "I think I used 40 lifetimes of good luck in those 40 minutes," he said.